The days of Maurice Lacroix being an entry level brand is long gone (click here), especially since the introduction of the Masterpiece collection. During BaselWorld 2010, that is going to be held from March 18 till March 25, Maurice Lacroix will be introducing a number of interesting models. Most interesting are the two different Phases de Lune timepieces, since a moon phase is a complication that speaks to everyone’s imagination. The Phases de Lune are from different Maurice Lacroix collections, namely that of the Pontos and the Les Classiques. First, the Les Classiques Phases de Lune Automatique. A classic shaped moonphase timepiece, with a day and month indicator near 12 o’clock, and a very stylish moon disc at 6 o’clock. The date indicator is the fourth hand on the dial, pointing to the day numbers on the dial. The dial is available in silver (as pictured below) or black, the hands are filled with luminova and the 40mm case is available in stainless steel or a 18ct gold/stainless steel combination, where the lunette is made out of 18ct gold. The case has been finished with both polished and brushed parts, giving it an extra edge when the (sun)light is able to play with it. 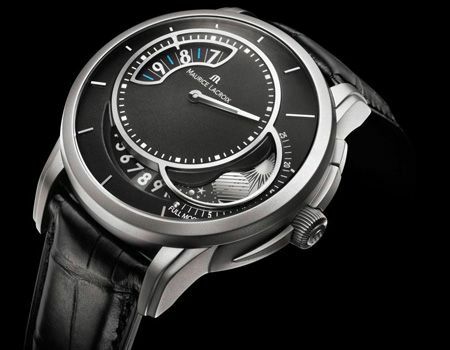 Maurice Lacroix uses a mechanical automatic movement (caliber ML37) for this Phases de Lune. This self winding movement has a 38 hours powerreserve and shows hours, minutes, seconds, day, date, month and moonphase. 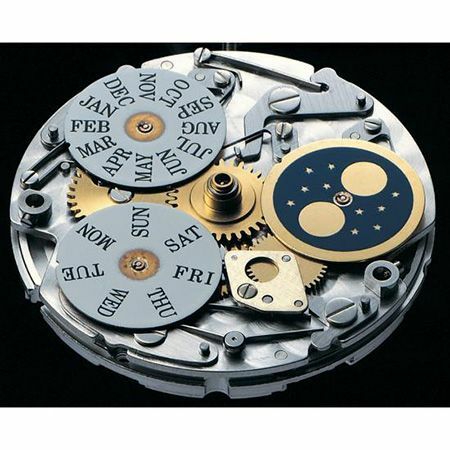 Maurice Lacroix uses this caliber in several other moonphase watches from their collection. The finish on this rhodium plated movement is quite nice, with its hand-decorated circular grain. The movement is based on the famous ETA2824-2 movement and uses an add-one module for all extra functionality. The other Phases de Lune is the one from the Pontos collection and is called Pontos D?É¬©centrique Phases de Lune, Limited Edition in full. It is significantly different from the Les Classiques Phases de Lune as you can see below, and probably aims more at the watch collector or buyer who loves a classic design with a twist. A fairly big twist. As you can see, the moonphase disc is located on 4 o’clock, the hours are indicated by a disc, the minutes by a hand (and also the only hand on this watch) and the date disc is at 6 o’clock. Below the moonphase disc you’ll notice that there is another disc, indicating the day/night. The titanium & sand blasted watch case has a diameter of 45mm and is therefore probably not suited for everyone out there. The movement ticking inside is the Maurice Lacroix caliber ML122, a self winding mechanical movement with a vibration of 28.800bph and a powerreserve of?Ç¬? 38 hours. The finish is comparable to the ML37 as discussed above. 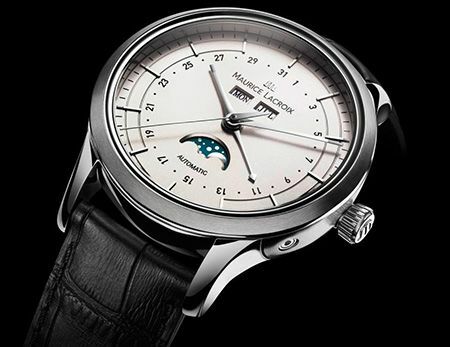 This Maurice Lacroix Pontos D?É¬©centrique Phases de Lune is limited to 500 pieces world wide. Prices on both models are still unknown.